Structure: one main pocket, a laptop intermediate layer, a front patch pocket, two side pockets. 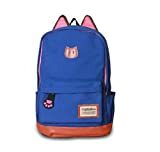 Style: simple sweet school style with cute cat ears design! This entry was posted in Luggage and tagged 2014, Backpack, Blue, C5004, Camping, Canvas, Colors, Design, Fashion, Girls, Ladies, lady, Laptop, Middle, Multifunction, Plaza, Royal, School, Several, Style, Super, Sweet, Trip by Perfect Vacation. Bookmark the permalink.